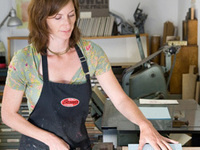 Macy Chadwick publishes artist’s books and limited-edition prints under the imprint In Cahoots Press in Petaluma, California. In her art practice, Chadwick strives to reveal that which is unspoken: to make tangible the ephemeral, to make visual our human experience and interactions. She will discuss her work as an artist, both individual and collaborative, as well as her new venture developing a new artist residency, In Cahoots Press & Residency. The residency provides housing and studio space to both emerging and professional artists with a focus on artists books, letterpress, printmaking, writing and collaboration.